Now, you can get complete Ganesh Chaturthi puja material pack online from Cycle Pure Agarbattis, India’s largest manufacturers of Agarbattis (Incense sticks). 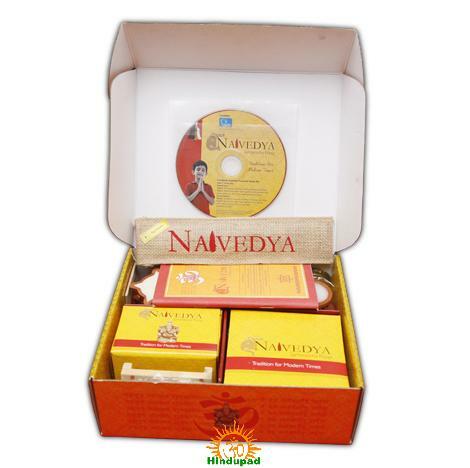 The puja pack is named as ‘Naivedya’. Cycle Pure is offering this Vinayaka Chavithi puja items pack for just 985 Rs.. The pack consists of… all the essential ingredients for Ganesh Puja like Karpoora, Kumkuma, Haridra, Chandanam, Gejje Vasthra, Deepam, Pugiphala (betel nuts), Akshata, Rangoli powder, Rangoli stencil, Kankana, Sambrani, Sambrani holder, Bhasmam, etc..
Apart from the above list of items, ‘Naivedya’ also includes an eco-friendly Ganesha idol, Instruction booklet in six languages which helps to perform Pooja in the traditional way and an Audio CD of Ganesha sloka.